Are The Prospects for Utility Stocks Dimming? The combination of weak forward power prices and the expectation for the Fed to taper back on the size of their security prices next year has weighed on equity prices in the utility sector. When looking at the Dow Jones Utility Index (DJU), it is clear that it has been in a wide upward sloping trend pattern since March 2009. That being said, the technical set-up of the DJU on longer-term charts is not particularly bullish. 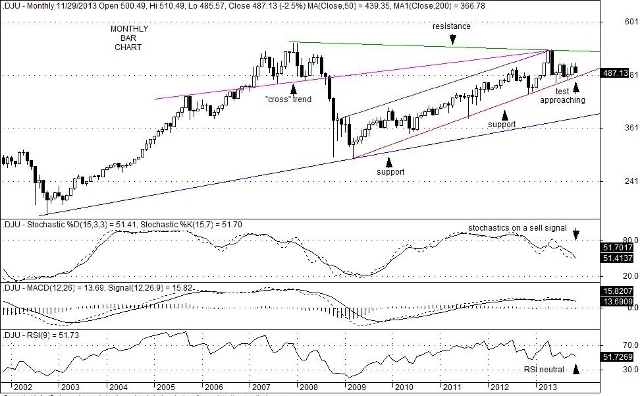 On the contrary, monthly stochastic and MACD studies continue to decline bearishly with RSI moving sideways within the neutral zone. 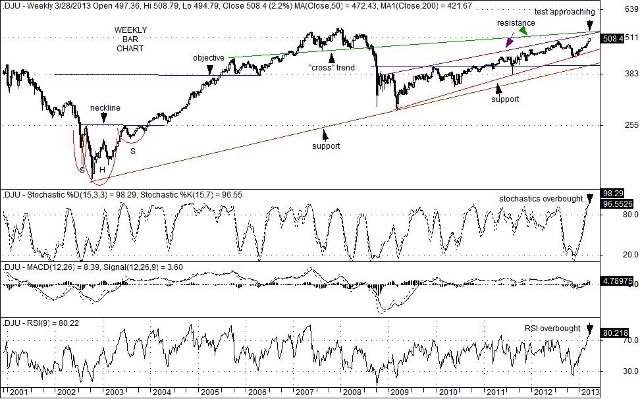 The problem for the Dow Jones Utility Index is that given its technically weak condition, a break below key trend line support currently at the 477 level could lead to a solid move to the downside and end its 4-3/4 year bullish trend. Restrained capital expenditures along with lackluster job gains suggest that the demand for power may remain muted for a while longer. The potential for Congress to keep the outlook for businesses muddied is also an issue, particularly with another round of debt ceiling maneuvering on the horizon. On the other side of ledger, muted power costs could ironically translate into big pluses for both business and individual consumers alike. For businesses, lower energy and utility prices would likely give domestic companies a competitive edge relative to their European and Asian rivals. To individuals, low power costs could be supportive to consumption which in turn could help expand economic activity on the margin. Over the short-to-intermediate term, utility shareholders could suffer for a bit longer however, with that sector of the market underperforming equity prices in general which will likely remain in a cyclically bullish trend. Are Utility Stocks Getting A Bit Pricey? Concurrent with a long process of declining interest rates, utility stocks (as well as many other investment forms) have benefited greatly. Since the March 9, 2009 intraday low of 289.57, the Dow Jones Utility Index (DJU) has risen by 75.5% while kicking off annual dividends payments in the 4%-to-6% range along the way. Just since the November 15, 2012 intraday low of 435.57, the DJU has jumped 16.7% not including dividends. While impressive, the Dow Jones Utility Index is now approaching a key resistance zone, represented by its long-term “cross” trend line at 535 and another trend line that currently sits at 526. With overbought technical conditions currently present on weekly bar charts, this resistance zone could prove difficult to break above any time soon. Many fundamental analysts already argue that utility stocks are now expensive relative to the industrials. This argument is highlighted by the fact that the 12-month trailing price multiple of the DJU is 25.03 as of Friday” close, versus a 12-month trailing price multiple of 15.95 on the Dow Jones Industrial Average. Although the current 3.04% dividend yield on the DJU is higher than the Dow Jones Industrial Average’s 2.44%, this dividend yield advantage is much less attractive than last year’s 4.09% DJU yield versus last year’s DJIA yield of 2.49%. Although the Dow Jones Industrial Average and the S&P 500 Index each closed at all-time highs on Friday, many market observers have nevertheless cited the defensive nature of many investors still. As a result, this aspect of current market psychology could keep utility stocks firm and rising for a bit longer. More evidence of improving economic conditions, characterized by a steeping of the yield curve, might on the other hand keep the upside in utility stocks relatively limited over the intermediate and perhaps longer-term. You are currently browsing the archives for the Dow Jones Utility Index (DJU) category.